Some presidential candidates are surging on the GOP side, according to a new Franklin Pierce University/Boston Herald poll. 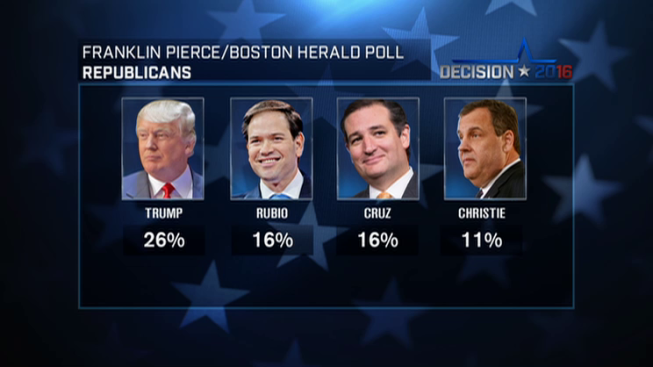 Donald Trump still holds the lead in poll. He has 26-percent, which is down two from October. However, Marco Rubio and Ted Cruz are now tied for second at 16. Chris Christie is also up at 11-percent, an eight point jump since October. On the Democratic side it's neck-and-neck in the Granite State. Vermont Senator Bernie Sanders’ double-digit lead is gone and he’s now at 48-percent, leading Hillary Clinton by just two points. Clinton is at 46-percent, which is within the margin of error, and Martin O'Malley at two-percent. The New Hampshire primary will be held February 9, just eight days after the Iowa caucuses.